Common purslane, Portulaca oleracea, is a highly variable, weedy plant in the purslane family (Portulacaceae) with a wide distribution. Although it is likely native to North Africa, the Middle East, and the Indian subcontinent, it had reached North America by pre-Columbian times and was in Europe by the late 16th century. It is now naturalized in most parts of the world, both tropical and temperate – equally at home in flower beds, cultivated fields, and roadsides or other disturbed or waste places. It has been grown for more than 4,000 years as a food and medicinal plant and is still cultivated in many places today. Common purslane is a low-growing plant with succulent leaves. It is considered quite nutritious because it is unusually high in omega-3 fatty acids (found mostly in fish and flax seeds) and contains significant amounts of vitamins A and C, as well as calcium, iron, magnesium and potassium and antioxidants. It also contains high amounts of oxalates (just as spinach does) so should not be consumed excessively by those susceptible to forming kidney stones. It is sometimes used as fodder and is fed to poultry to reduce egg cholesterol, and was also used traditionally as an ointment for burns. 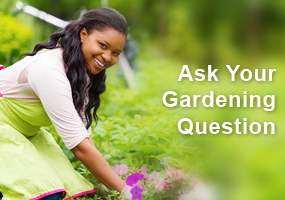 Some other common names include garden purslane, little hogweed, pusley, and wild portulaca. It’s called pourpier in France and verdolaga in Mexico. Purslane is a fast-growing herbaceous annual with succulent leaves and stems. Even the oblong cotyledons (seed leaves) are succulent. The multiple smooth, reddish stems originating from a single taproot are mostly prostrate, forming a mat covering up to 3 feet in diameter. Depending on the amount of moisture available, the plant may be quite low-growing or more erect up to 16″ tall. 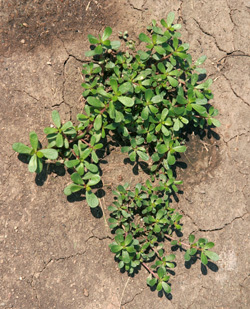 A seedling of common purslane (L) and small plants, just beginning to branch (C and R). The fleshy leaves are borne on reddish stems. The alternate leaves are clustered at stem joints. The individual leaves are quite fleshy, storing lots of water when available. Each flat green leaf is oval to spoon-shaped, broadest near the rounded tip, and without any indentations along the often reddish margin. They rarely have petioles and are attached directly to the stems. Plants will flower whenever moisture is sufficient. The ¼ – ½ inch wide yellow flowers have five (sometimes four) notched petals, numerous yellow stamens, and several pistils that are bunched together in the center. They typically open only on hot, sunny days from midmorning to early afternoon. The flowers occur in leaf axils at the stem joints or terminally, with just a single one opening in each leaf cluster at a time. Each inconspicuous yellow flower only blooms for a short time. Although pollinators will visit the flowers, the plants are self fertile so almost all flowers will go on to produce numerous tiny brown to black seeds in a small pod. When the seeds are mature the ovoid capsule bursts open along a transverse groove to release its contents. The seed pods contain numerous small seeds. 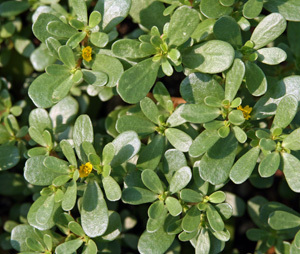 Purslane grows in full sun in almost any soil, from muck high in organic matter to heavy clay. It does best in warm weather, and young plants will remain small and stunted when conditions are cool. Although it prefers regular water it can tolerate drought. It is easily dug or hoed out where unwanted, but these plants should be removed from the garden as cut stems from larger plants will root readily at the nodes to become re-established, and seeds will mature in the pods even if the plant is pulled and left with its roots turned upward. Seeds can remain viable in the soil for several decades. The plant is frost tender, and will be killed by the first freeze in fall. Purslane is easily grown in the vegetable garden from seed, ready for harvest in 6-8 weeks. 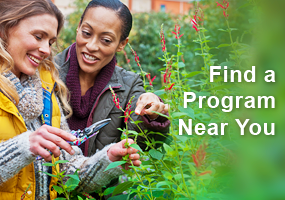 Sow in fertile, well-drained soil and thin to 4 to 6″ apart. The entire plant can be harvested, or the stems can be cut back to within two inches of the crown and the plant will regrow, providing edible leaves for most of the summer (although successive sowings may be preferred for more tender young leaves). When grown as a food crop, water regularly as moisture-stressed leaves are not as palatable as those from well-watered plants. Purslane has few pests, although in some parts of the country purslane sawfly, Schizocerella pilicornis, and a leafminer weevil, Hypurus bertrandiperris, will damage or kill the plants. In many places outside of North America purslane is commonly eaten as a fresh or cooked vegetable. In the US it can occasionally be found in specialty stores or at Farmer’s Markets. Purslane for sale as a vegetable at a Farmers Market. The stems, leaves and flower buds have a slightly tart or sour and salty taste. The intensity of flavor is influenced by the physiology of the plant. In hot, dry conditions purslane switches to photosynthesis using Crassulacean acid metabolism (C4) as a means of conserving moisture. In this system the leaves trap carbon dioxide at night (instead of during the day as with normal photosynthetic process, when open stomata would allow valuable water to escape through transpiration) and convert this to malic acid. Then the malic acid, which has a sour flavor, is converted to glucose for storage during the day. So leaves picked early in the day when malic acid concentrations are highest will have the tartest flavor. 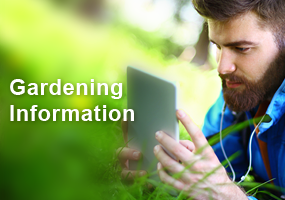 There are several named cultivars that are grown as crops, but few are available in the US. 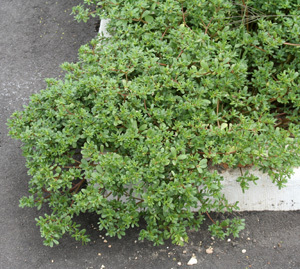 Purslane is used in many cuisines around the world, especially in salads, soups, stews, and tomato sauces. When cooked purslane becomes mucilaginous, and will act as a thickener in soups or stews. In Greece the leaves are fried in olive oil, then mixed with feta cheese, tomato, onion garlic and oregano. The seeds are also edible. Thank you so much. I was always told it was sedum and not edible so just pull it. I will now let it grow and just keep it contained. Can my potted purslane be wintered in zone 6 and survive till spring? So I should get rid of all of it if not my flowers will die?? Is this weed good for goats to eat? With the prolific seed production and lasting for 10 years, no wonder I see them all over in sunny location. As a Dietitian it was interesting to learn that purslane is a source for omega – 3 fatty acids. I did not realize all of the uses for purslane. I always thought of it just as a weed to pull. Interesting. Thanks for the numerous tips on using purslane in cooking. Its use in chicken feed to reduce egg cholesterol is news to me. Versitile weed indeed. On a trip to Greece, I saw locals digging purslane up and taking it away in bags. Now I know they were probably preparing a tasty (and healthy) dish by frying it in olive oil and mixing it with feta cheese, onions, garlic, tomatoes and oregano. Doesn’t seem like such a bad “weed” now. Unless I find in growing in my flower bed. 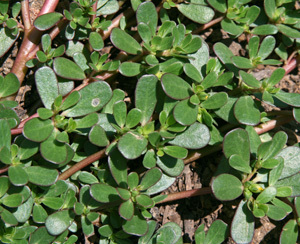 Purslane is cultivated for food and medicine and ointment for burns. Food crop needs water regularly to maintain taste. I am going to try this next year!